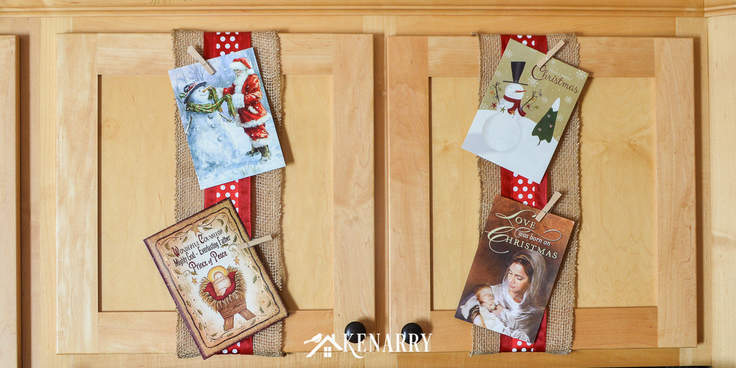 Use wide ribbon, burlap and small clothes pins for displaying Christmas cards on your kitchen cabinets so you can enjoy looking at them throughout the holidays. Why bother throwing all those Christmas cards you receive in a basket? 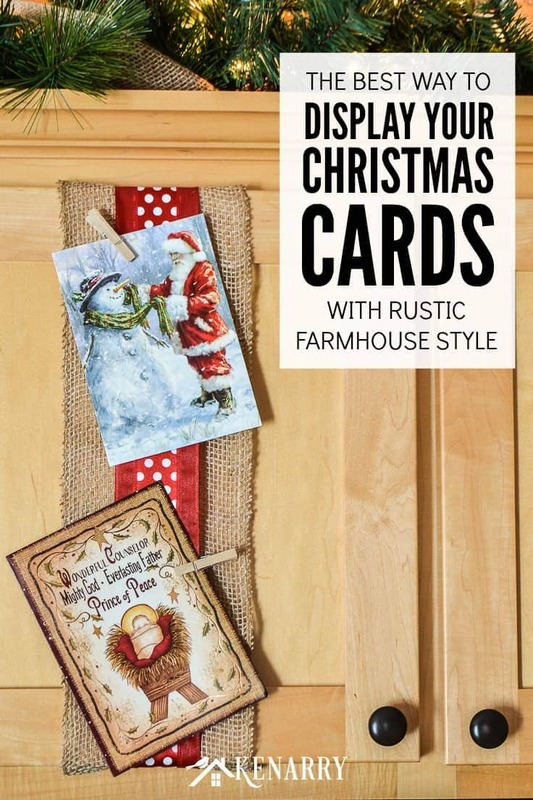 Instead you can use wide ribbon, burlap and small clothes pins for displaying Christmas cards on your kitchen cabinets. 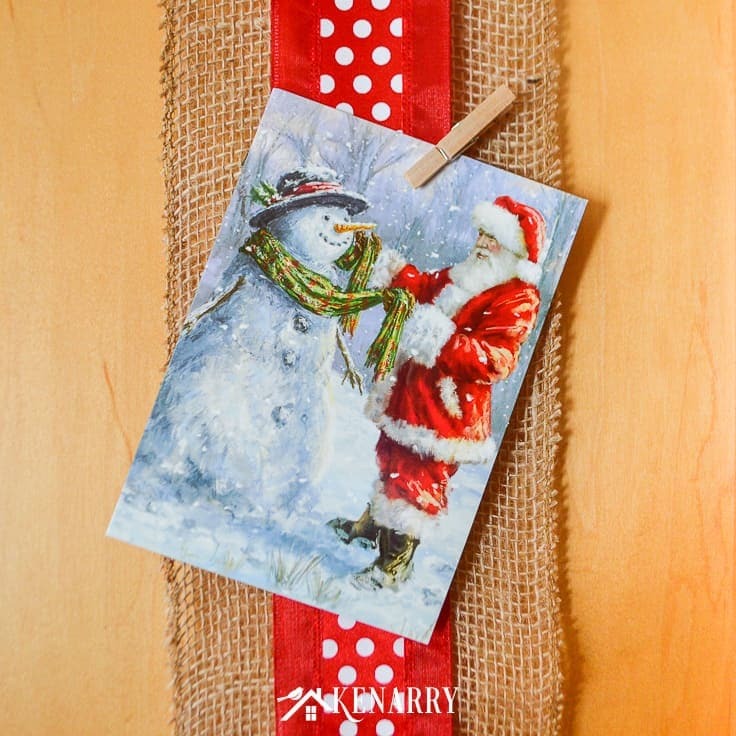 Once you learn how to hang Christmas cards on a ribbon, you can enjoy looking at them all season long. I have a confession: I love Christmas cards. They may be considered a gigantic waste of paper to some people. And they’re certainly not the most environmentally friendly way to send glad tidings to friends and family over the holidays, but I love them. Each year, I love to create my own unique cards and send them to over 180 addresses. (At this rate, the US postal system should really be sending us a thank you card…) I have no idea whether the recipients bother displaying Christmas cards. They may not do anything with the cards when they get them, but I still love sending the cards. Because we send so many cards, we also receive a huge number of cards in the mail. I must admit I get giddy this time of year when my husband brings in the mail when he gets home from work. No matter what I’m doing, I immediately stop to sort through the pile of mail. Tossing aside the junk mail and bills, I can’t wait to find all those large rectangular envelopes. My heart swoons as I see the return addresses of friends near and far. Even though I follow along with many of their lives on Facebook, it still makes me smile seeing their family photos and highlights from the past year on beautiful card stock. For years, when I’d open the cards, I’d simply toss them in a festive basket on an end table where they would remain untouched for the rest of the holiday season. Occasionally a random visitor might flip through the card basket to see if they happened to know any of my family or friends. But honestly I never looked at them again until the season was over. 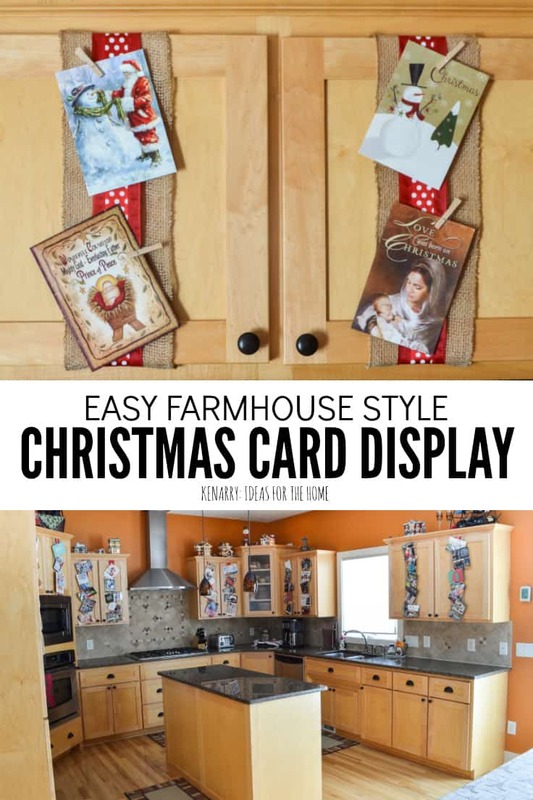 That all changed when I came across a fabulous idea on Pinterest from two different sources: Greener Grass and Budget Wise Home — they used wide ribbon for displaying Christmas cards on their kitchen cabinets. Genius! It’s a low cost idea and the cards can be thoroughly enjoyed throughout the entire holiday season every single day as you’re preparing and cooking food in your kitchen. 1. Buy or gather your supplies. Visit your local Hobby Lobby, Michael’s or other craft supply store to choose extra wide ribbon. I used two inch wide satin wired ribbon. To add texture and farmhouse style to our Christmas card ribbon display, I layered the satin ribbon over top of 5″ wide burlap ribbon. While you’re at the craft store, look for small clips of some sort to hang the Christmas cards on the ribbon. I found small wooden clothes pins at my local store. I’ve left them plain, but you could paint or decorate them to add a little more pizzazz to your display. 2. Measure and cut the ribbons for displaying Christmas cards. Wrap the ribbon around your cabinet doors to measure the amount you need. Be sure to leave at least a few inches of overlap, then cut the ribbon. 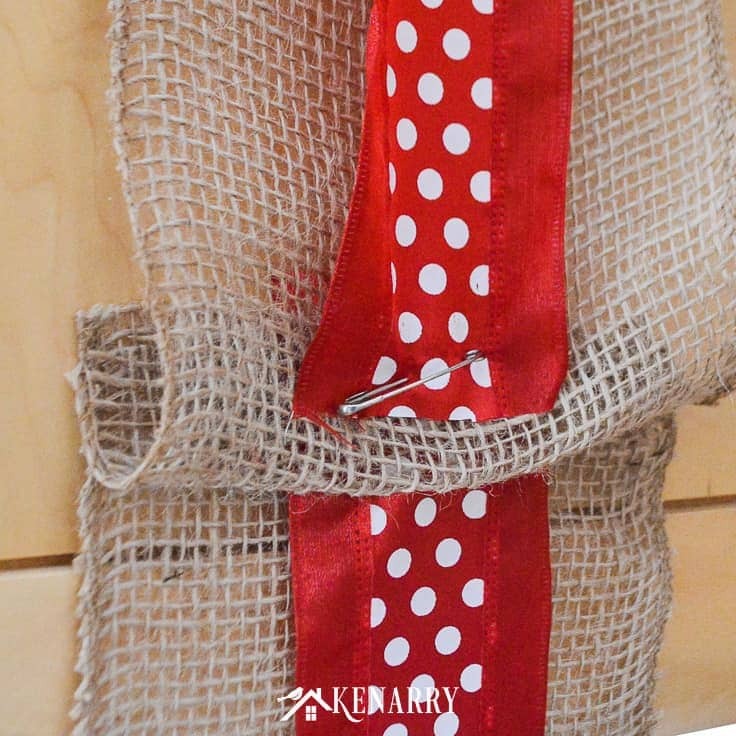 Repeat the process with the burlap ribbon if you’re planning to layer the two like I did. 3. 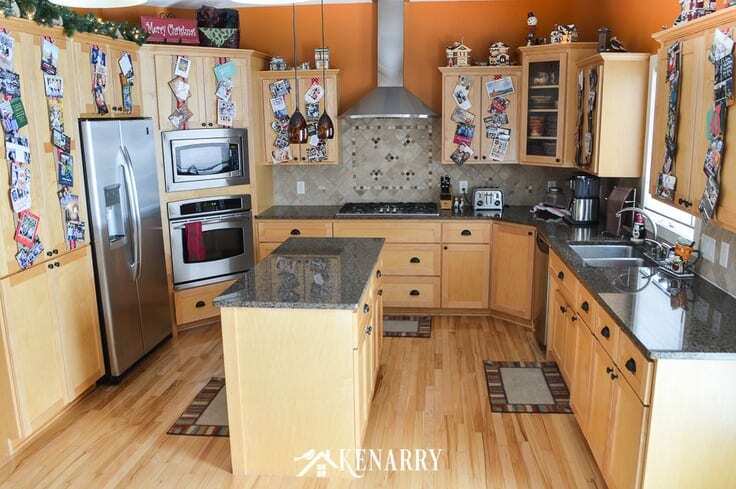 Secure the Christmas ribbon on kitchen cabinets. 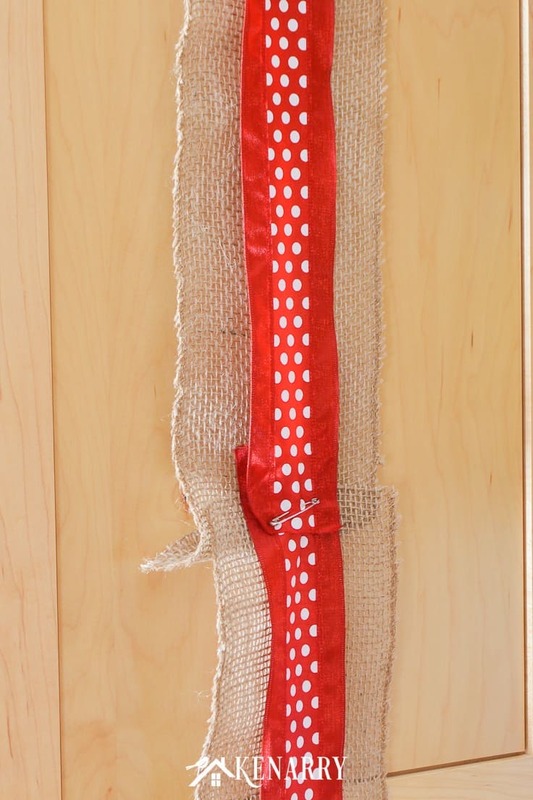 Use a safety pin to secure the ribbon on the inside of the cabinet doors. 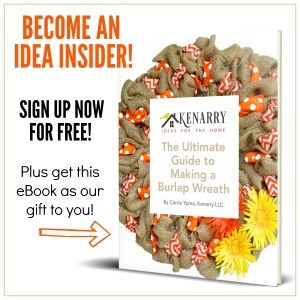 As you do so, fold the edges of the burlap ribbon under to prevent fraying. You could use tape for this step, but I was concerned it might leave a sticky residue on my kitchen cabinets. I also wasn’t sure whether tape would be strong enough to hold the ribbon in place if some of the Christmas cards were heavier. 4. 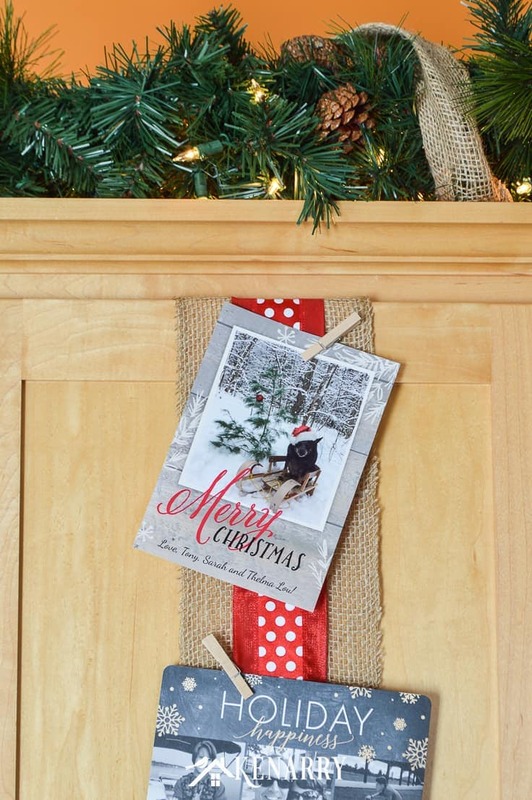 How to hang Christmas cards on a ribbon. Once the ribbons are in place, you can easily start displaying Christmas cards as you receive them. 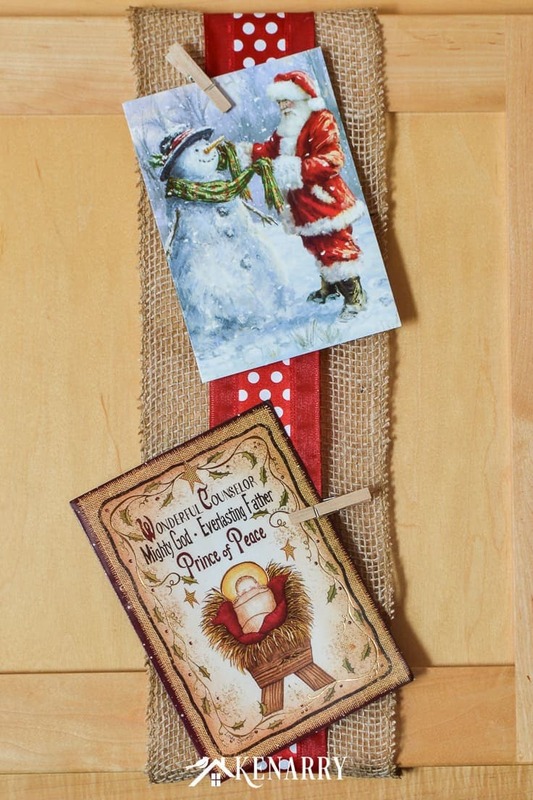 Each time you get a new ones in the mail just hang the Christmas cards on a ribbon using one of the small wooden clothes pins. I keep my wooden clothes pins in a little penguin mug inside one of my cabinets. This way they’re always readily available each time we get new Christmas cards in the mail. 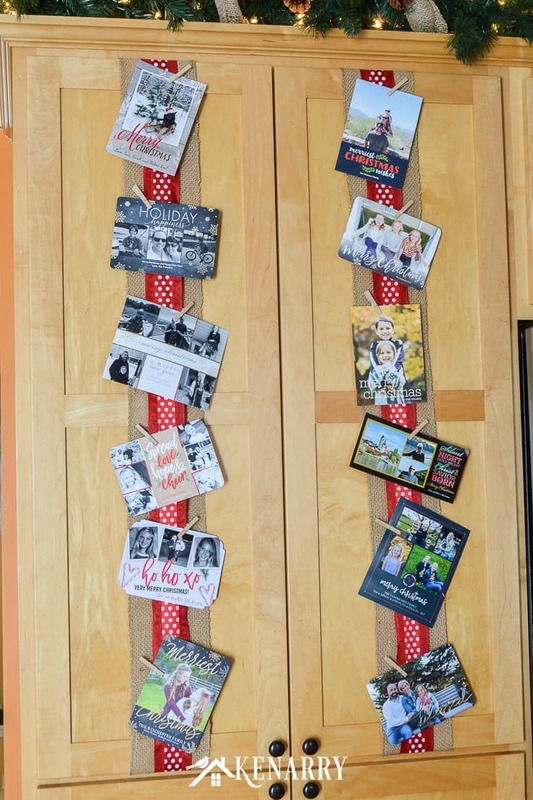 Save your Christmas card ribbon display to use again next year. At the end of the season, once I remove the cards, I wind the ribbon into a little roll. Then I use the safety pin to hold it together and attach a note indicating the cupboard door where it was used. Now when people visit during the holidays, I find them admiring our cabinet doors. 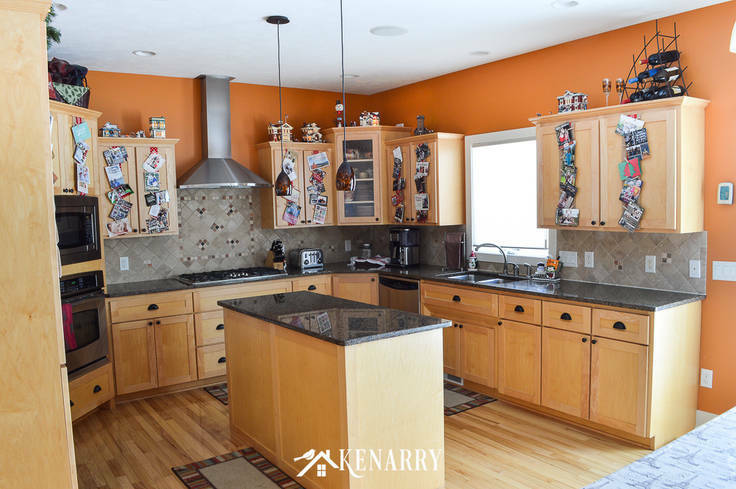 They love seeing all of the Christmas ribbon on kitchen cabinets festively displaying cards for all to see. Even more so, I love seeing the Christmas cards over and over again as I move about my kitchen, even if I’m just reaching for a glass of water. The post idea is creative. We could match the ribbon with the border of the photographs that will look much attractive. Thanks for commenting! I’m glad you liked the idea. I’m not sure how we’d match the border of the photographs with the ribbon, though since all of the photographs/cards come from different family and friends around the world. It could work, though if you were only displaying your own family Christmas photos on your cupboards, though.